People aren’t buying into the propaganda of fake news anymore; it was a defining point that made people spite-vote for Trump, an issue that helped propel #GamerGate globally, and now seems to be affecting Netflix. Subscribers of Netflix are threatening cancellations if the streaming service keeps focusing on issues that appeal to Social Justice Warriors, such as defending the current wave of fake news being propagated by the establishment media. The trailer for Nobody Speak isn’t very long but it’s very poignant. It attempts to portray news journalism as being under attack from billionaire interest groups and that it’s at risk of being subverted by corporatists. Average viewers aren’t buying it. 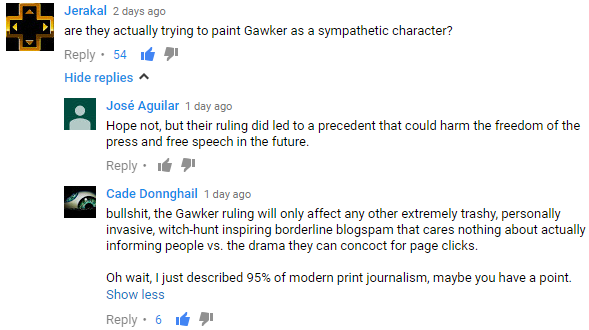 Critical feedback on the YouTube page is rife with criticisms of a political nature, with a lot of people saying that Gawker deserved to burn and shutdown due to their invasive reporting and tabloid-style muckraking. The downvotes on the trailer says everything. There’s also a debate about Trump feeding information to the Russians in order to secure the election (although I have no idea how people can still believe this when he wasn’t even President before he got elected and had nothing worthwhile to send them), while others unanimously agreed that Gawker biting the dust was definitely praise-worthy and anyone defending Gawker’s invasive and tawdry reporting is defending shoddy journalism. When nearly half the people are angry and downvoting the trailer and reacting negatively, something is definitely wrong. Some people tried to use the excuse that the trailer isn’t the whole documentary and that they should wait and see it first before judging, however they were quickly shot down by people stating that the whole point of the trailer is to convey what the documentary is about and if it’s about defending the current fake news in establishment media then it isn’t worth watching. One thing worth pointing out is that establishment media has taken on a stark pro-Social Justice Warrior stance, creating either false narratives or disinformation to rile people up and create racial, class, gender, and political tension amongst people. So far it’s working. People, however, have become increasingly angry at the slant taken in news media, so much so that reports indicate that trust in news media is at an all time low. This has also played into raising the stress levels in America, as inflammatory content spread through social media has burdened the average person with more stress than in years past. Netflix throwing in their lot with supporting unethical journalism and attacking those who have taken mainstream media to task for fake news, lopsided reporting and disinformation campaigns, has led some people to threaten to cancel their Netflix subscription. This is despite the fact that Netflix just recently surpassed cable when it comes to subscriber counts, according to Fortune. The rest of the comment section pretty much plays out like the comments above. A few people try to defend Netflix, stating that those watching the trailer shouldn’t form opinions until they watch the documentary, but most people with common sense are having none of it. Since #GamerGate happened back in 2014 — a grassroots movement fighting back against unethical journalism — the news media has really ratcheted up their slanted take on the news, even attempting to puppeteer the public’s political voting patterns, but it backfired much to their chagrin. I wonder if Netflix will greenlight a documentary looking into the uneven and slanted take on the news that the mainstream have adopted lately, or would that go against their current agenda? Then again, they already put the axe to Cassie Jaye’s The Red Pill, as reported by Natural News, so it’s doubtful that they’ll even bother with a documentary that exposes the narrative of the mainstream media.